President Bill Clinton, Honorary Chancellor of the Laureate International Universities network, described graduation as “the day when you enter the world with the potential to effect positive change for those in need, for our environment, for our shared future.” And the world awaits INTI International College Subang (IICS)’s graduating Class of 2010 who will venture forth with new skills and abilities to make a difference in their lives and the lives of others for the better. IICS students of the 4+0 Northwood University Program graduated for the first time with prestigious degrees from one of the best Business Specialty Schools in the USA. They represented a new generation of high achievers honed in an environment that fosters education, enterprise and character by bringing academic credentials and real world business experience into the classroom. 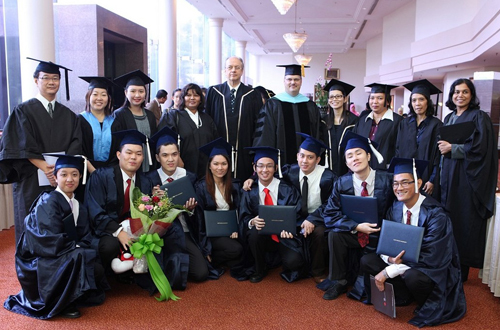 Graduates pose with Northwood University representatives and members of INTI‘s faculty. The commencement of these graduands alongside students of INTI‘s Diploma in Business, Engineering, IT and Mass Communication programmes marked the first graduation ceremony exclusively for IICS since it become part of the Laureate International Universities network in 2008. The ceremony at Grand Dorsett Subang Hotel also saw the participation of INTI’s industry partners and associates, including Bernama TV, TNT Express and Freescale Semiconductor, who presented their industry awards to high achieving graduates. The Bernama TV award for the Most Outstanding Student (for Mass Communication), TNT award for Student Leadership & Service, and Freescale award for Leadership were presented to Ng Kok Keat, Hew Wan Ting and Chow Voon Yang respectively. Siow Shy Yee was the recipient of the University Prize for Outstanding Achievement awarded by Northwood University. Siow Shy Yee (left) celebrates with fellow graduates Ranika Janani Palihena (centre) and Hew Wan Ting. In her graduation address, Mrs Joyce Yuen, President of IICS, urged graduands to contribute to society at every available opportunity. “Our vision for you is not just to achieve academic and professional excellence but also to become well-rounded individuals who can make positive differences in your own lives, and in the lives of people around you,” she said. The INTI Education Group has 6 campuses across Malaysia, including INTI International College Subang, and is part of the Laureate International Universities network, which has a presence in 24 countries around the world. INTI has over the years produced quality graduates who have gone on to pursue successful careers in key pillars of the economy; contributing significantly to society.